The purpose of this 3-month quasi-experimental pilot study was to examine the effect of a physical activity and dietary education program on body mass index (BMI) and resilience. Participants were given data-storing pedometers to record their physical activity, attended classes on healthy eating, and used portion control tools from http://ChooseMyPlate.gov . MyPlate usage and commissary purchases were collected weekly. BMI and resilience scores were measured at baseline, 6 weeks, and 12 weeks. Twenty-nine female prisoners completed the study. There was a statistically significant reduction in BMI after 12 weeks (χ2 = 7.56, p = .023) and resilience levels increased but did not reach statistical significance (χ2 = 1.66, p = .437). 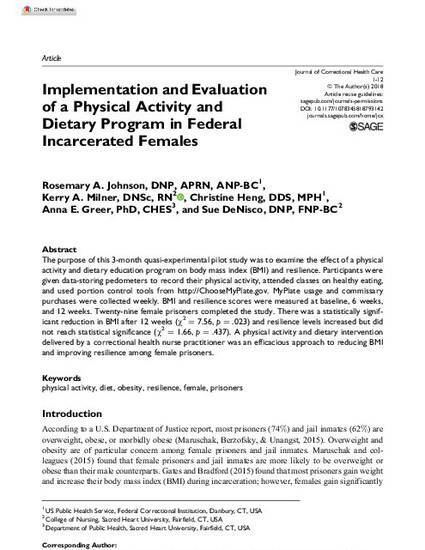 A physical activity and dietary intervention delivered by a correctional health nurse practitioner was an efficacious approach to reducing BMI and improving resilience among female prisoners.